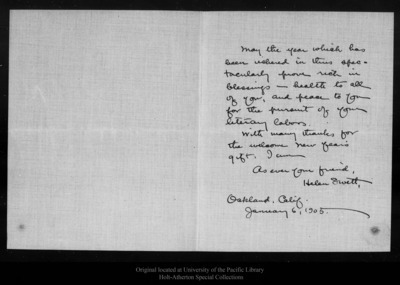 Letter from Helen Swett to John Muir, 1905 Jan 6. May the year which as been ushered in this spectacularly prove rich in blessings - health to all of you, and peace to you for the pursuit of your literary labors.With many thanks for the welcome new year's gift, I amAs ever your friend,Helen SwettOakland, Calif.January 6, 1905. Original letter dimensions: 16.5 x 26 cm.